AAA-approved and spectacularly pink—First Lady Mamie Eisenhower's favorite color—inside and out. For a weary motorist, arriving at the Malibu Riviera Motel in 1948, after a drive along the mostly uninhabited Malibu coast, it must have felt like being transported to the Technicolor land of Oz. After decades of neglect, this relic of the road trip-era is now the artfully hipster Native Motel. The owners have embraced the original 1940s ambiance and restored everything to a period feel. Rooms reportedly cost around $200-$400 a night, soon with coffee and waffles served out of an Airstream every morning. But the old Riviera Motel is an exception, because most of Malibu's motel history is lost or changed beyond recognition. This postcard is from the wonderful Eric Weinberg Collection of Matchbooks, Postcards and Ephemera at the Pepperdine University Library's Digital Archive. 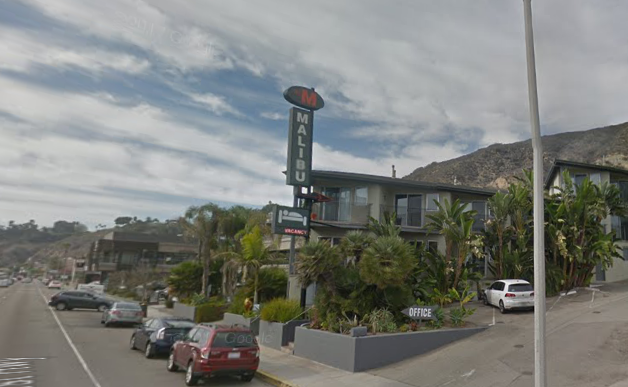 No one cared much about the Great Malibu Motel Extinction of the 1980s and '90s. It was a gradual phenomenon, more like the end of the last ice age than the sudden change precipitated by an asteroid, but rising real estate prices were just as fatal to local guest services in their own small way as the arrival of the asteroid Chicxulub to the dinosaurs. Now, when almost all this particular endangered species, famous for its boomerang-patterned formica, heated pools, and signs proclaiming "AAA Approved!" is almost entirely gone, our elected officials in Sacramento suddenly care very much. 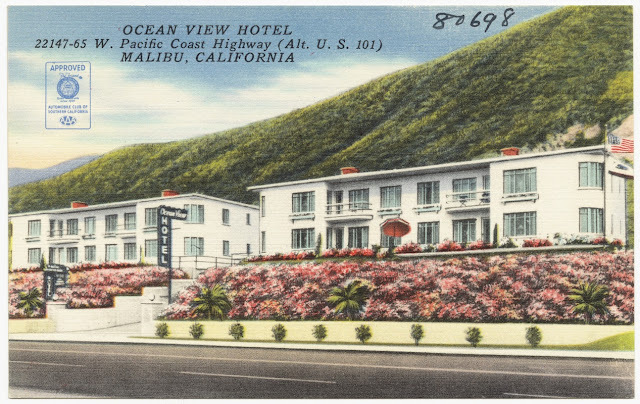 The lavish two-story Casa Malibu Motel, built by the Harris family in 1947—the golden year for motels in Malibu, was popular with the Hollywood crowd in the 1950s, when it was at the peak of motel perfection, as well as being a family vacation destination. Today, it's the $1000-$2000-a-night Nobu Ryokan, and still presumably big with the Hollywood set, but no longer accessible to ordinary mortals (those of us without a spare $2K can enjoy a virtual visit here). Just in time for the opening of the preposterously pricy $2000-a-night Malibu Nobu Ryokan hotel, a new California assembly bill seeks to turn the clock back to the era of the road trip, encouraging motel redevelopment projects and opening up the possibility of using public lands for new hotels, campgrounds, and hostels in the Coastal Zone that would be available to all, not just the boutique set. Not everyone is enthused about the plan, at least not here in Malibu. That's because the bill as written seems to have several large loopholes that activists fear could generate an unintended building boom in parklands that were saved for conservation, not development. They are also concerned that recreational development in the Santa Monica Mountains National Recreation Area, including Malibu, no matter how desirable it may appear, would put large numbers of potentially clueless visitors right in the middle of an area with some of the highest fire danger on the continent. Others question the feasibility of bringing back cheap motels. The era of Kerouac has come and gone, they say. The world has changed. Motels and campgrounds were an outgrowth of early car culture. In a weird way, so were many of our Western National Parks, where the routes through the parks were built to showcase the best vistas to visitors with cars, not to protect resources or offer easy access to hikers. 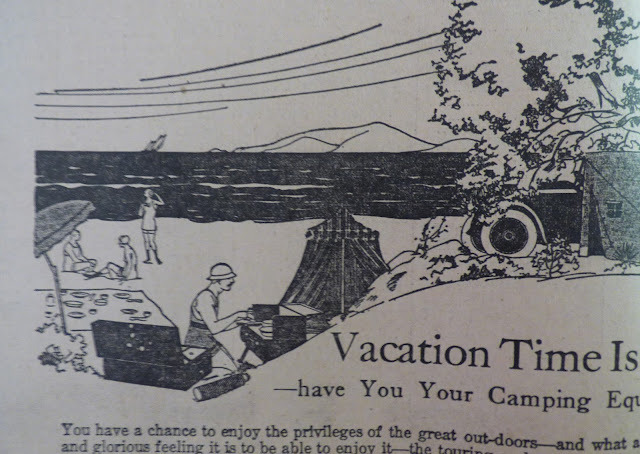 Here's an ad for Red Crown gasoline from 1923, encouraging car owners to embrace "the privileges of the great outdoors," with a scene from a dream camping vacation—frolicking on the sand, a tent on the beach, cooking over a camp stove, the faithful automobile, whitewalls gleaming, waiting to carry the vacationers to their next exciting destination. The original motel and campground boom all across the county is tied to the history of the automobile. When Mr Ford, aided and abetted by the Automobile Club of America, opened up that new horizon for travel, campgrounds and the new motels—a portmanteau word made out of motor + hotels—sprang up all over, including throughout the Santa Monica Mountains. An Automobile Club map from 1915 encourages drivers to explore the Santa Monica Mountains. 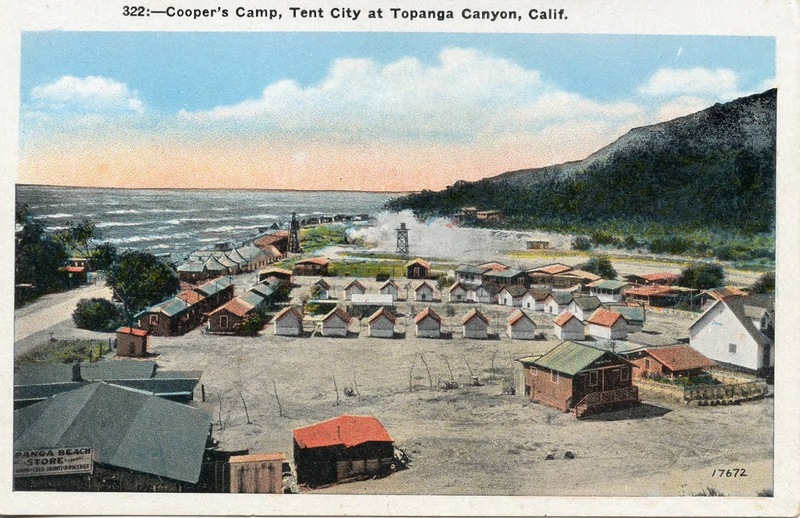 Topanga Canyon was a popular destination, and campgrounds and cabins cropped up throughout the canyon, recreation replacing agriculture as a cottage industry. Early 20th century beachgoers had a luxury that has almost vanished today. 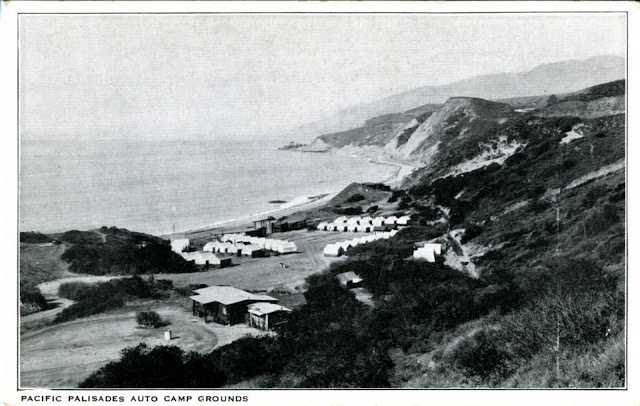 Entrepreneurial landowners cobbled together tent cabins in Santa Monica Canyon and at Topanga Beach for visitors. Beach shacks, bath houses, and tents popped up all along the coast. Here's a 1920s postcard from the Eric Weinburg Collection advertising the joys of auto camping at what looks like the beach by Temescal Canyon. Even as early as the 1880s, when horsepower had a much more literal meaning, beach and canyon camping was a popular activity. A stagecoach catering to summer beachgoers transported intrepid travelers to the Las Flores Inn for the day, and private campgrounds offered a taste of California rancho life to vacationing Angelenos. The Marquez family's campground in Santa Monica Canyon offered the best of beach and canyon recreation opportunities. This photo, dated 1885, is from the Santa Monica Public Library Image Archives. 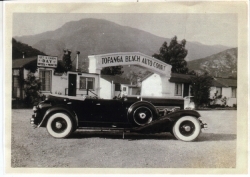 The Topanga Ranch Motel, build in the 1930s, was one of the first local hostelries to cater to the motorcar crowd. It grew out of the tents at Cooper's Camp, shown in the postcard, below. That row of cabins along the road eventually grew into the Topanga Ranch Motel. 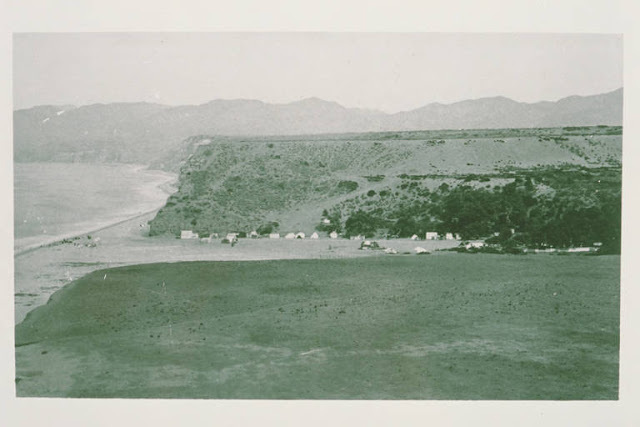 However, ramshackle huts and canvas tents lined the beach from Santa Monica to the Palisades long before there was a Pacific Coast Highway. 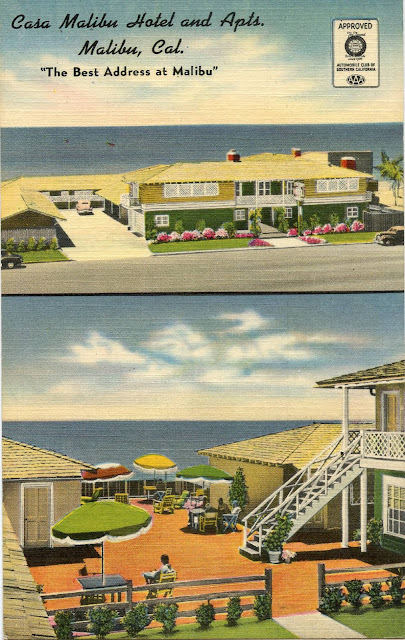 In fact, there were hotels, cabins, cottages and bath houses all over the coast, followed in the late 1930s by motels, but one long stretch of the coast was of out of reach for vacationers: the old Malibu Rancho. It wasn't until the 1940s that the motel craze reached the coastal enclave. The Topanga Ranch Motel, shown here in the 1930s, when it was owned by William Randolph Hearst, is a classic example of the early bungalow-style motel. When State Parks acquired the site in 2001, many preservationists cherished the hope that the motel would be restored using the Coastal Commission's program to assess "in lieu" funding to mitigate for the loss of public benefit at other development projects, but the old motel is still shuttered, quietly decaying. 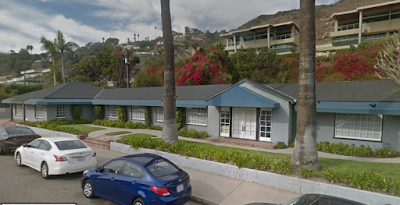 Here is a Google Street View look at the long-shuttered Topanga Ranch Motel. 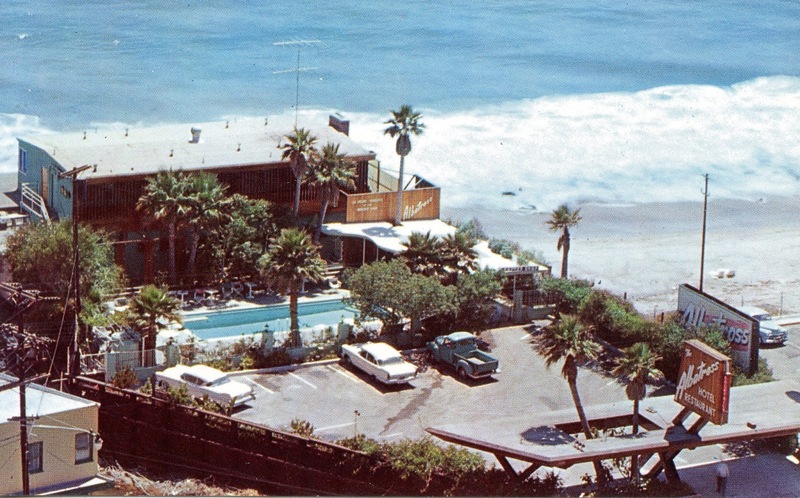 According to the Los Angeles Times, Carl's Sea Air Motel—later known as the Sunspot—was one of the first modern motels not just in the Malibu area but in California. 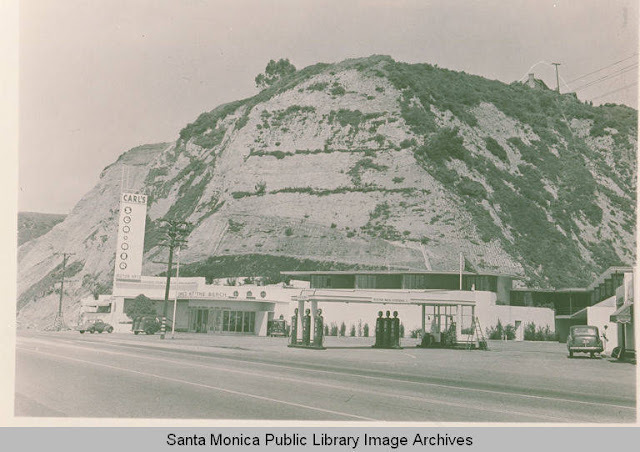 This image, from the Santa Monica Public Library Archives, is dated 1935. Carl's Motel—better known as the Sunspot, just east of West Channel Road, was one of the first motels in the area. This 12-room motel exemplified the motor hotel ideal. Build in 1938, it was designed by well-known Los Angeles architects Alexander Schutt and A. Quincy Jones. Despite its decline and ignoble end as a dismal disco dive and house of ill repute in the 1970s, this motel, designed to offer food, accommodation, and gas, was a landmark. 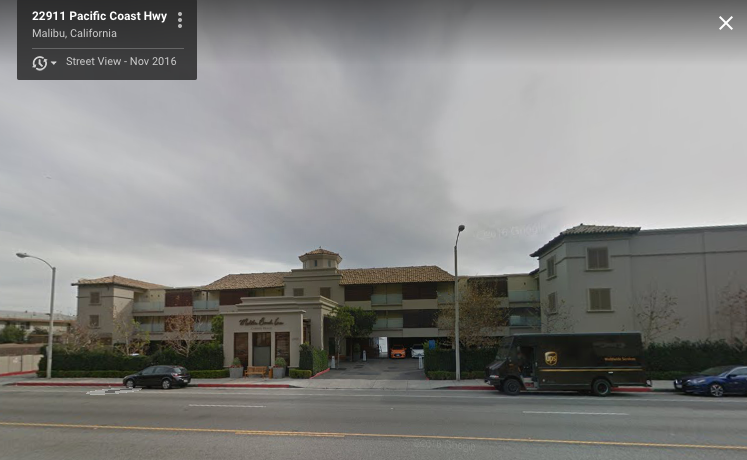 In his application to the Los Angeles Cultural Heritage Commission to get the building listed as a historic landmark, preservationist Bradley Weidmaier described the motel as "a brilliantly orchestrated complex." Unfortunately, this motel's architectural significance wasn't enough to save it. After Pacific Coast Highway—Roosevelt Highway in those days—was built, and the Rindge family were forced to sell off large chunks of the Malibu Rancho to pay the expenses that piled up during the battle to keep the highway out, more hotels began to pop up, but only after WW II. Gas and tire rationing, curfews and blackout regulations, the military closure at Point Dume, and the general lack of manpower put all kinds of development plans in Mlaibu on hold for the war years. The Malibu Beach Motel still looks much the same but is currently an office building. 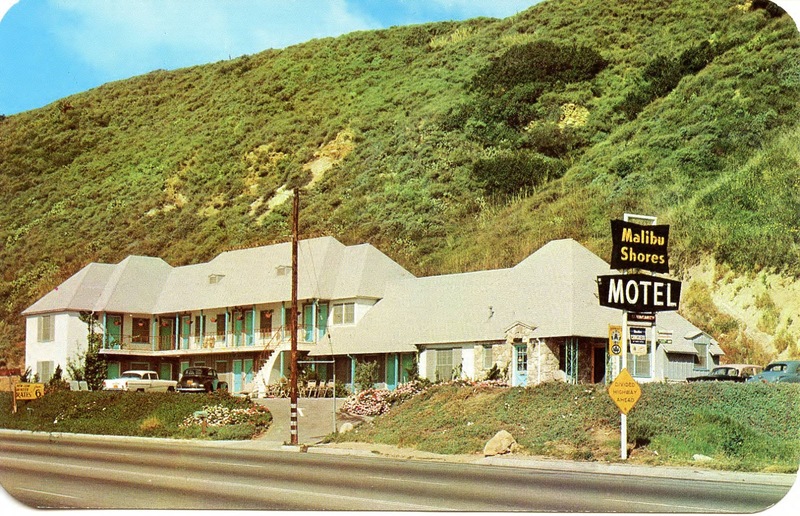 Built in 1941, this was the first motel actually in Malibu. It served as something of a general store and gathering place during the difficult war years. This image is from a 1949 ad, once again in the collection of Mr Weinberg. The Malibu Beach Motel, once famous for its Hollywood clientele, is now a sedate office building that houses a development company. Image: Google Street View. 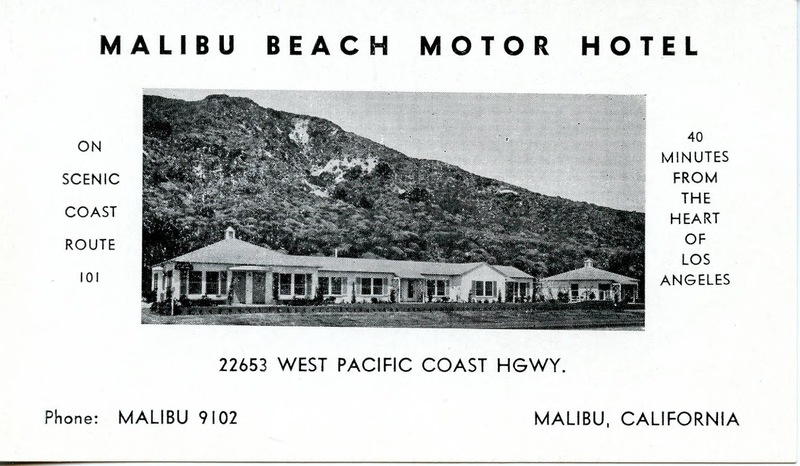 Malibu was a modest mecca for motel builders in the 1940s and '50s. Architect Richard Neutra designed the fabled Holiday House for retired director Dudley Murphy in 1947. 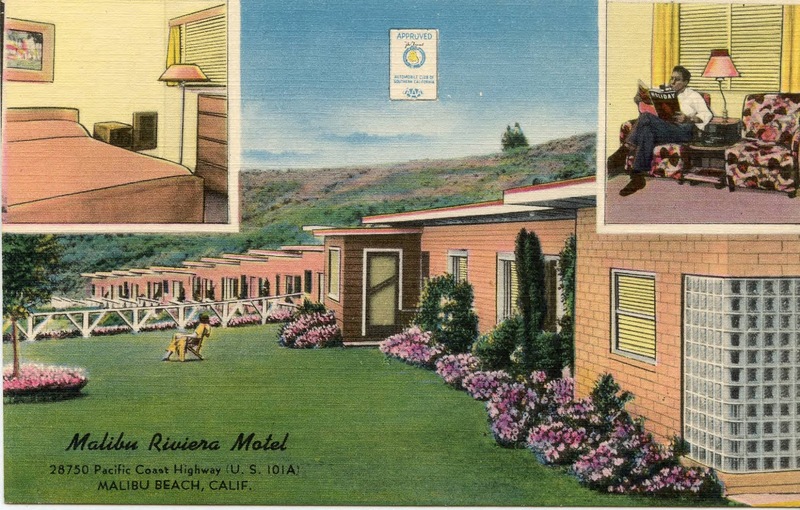 The Wilcox family built the Malibu Riviera Motel with their own hands, the same year. The other Malibu motels over the next decade ranged from the modernist Malibu Sands to the spectacularly kitchy Tonga-Lei. 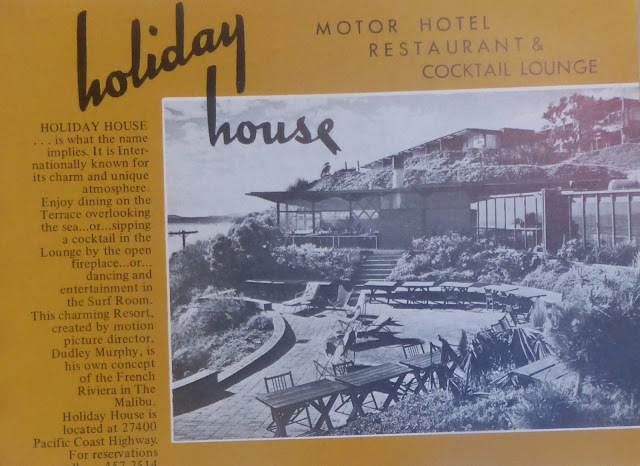 The Holiday House, a mid-century modern beach paradise, was designed by architect Richard Neutra shortly after WW II for film director Dudley Murphy. The Surf Room is still a restaurant—Geoffrey's, but the motel rooms were converted into apartments in the 1980s. The image is an ad from around 1968. Malibu motel ads from 1949. My mom, who grew up back east, tells me that a patio was a big deal in the 1950s, especially for transplanted or relocated East Coasters and Midwesterners, to whom a sliding glass door to a patio that could be used year round was an almost unimaginable luxury. This motel is still there, too, wonderful 1940s curved corners and all, but it's all apartments now. Image: Google Street View photo. 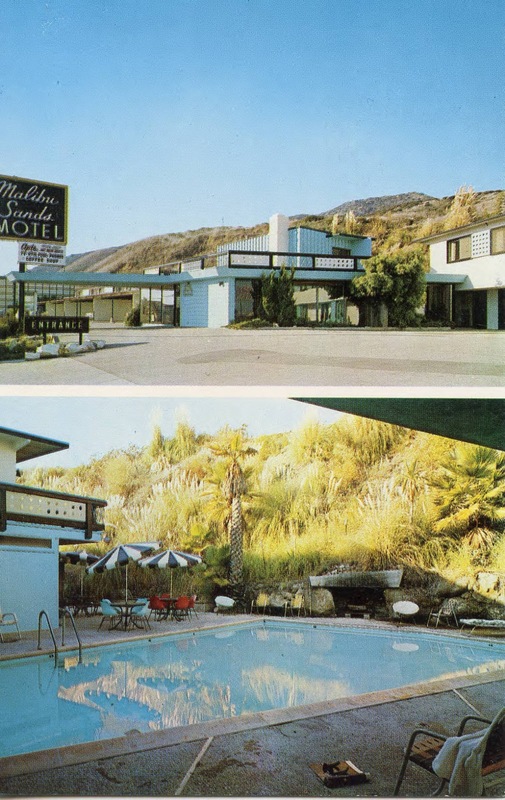 The Malibu Shores Motel was built in the early 1950s by Betty and Nathaniel Roberts. The October 2, 1953 Malibu Times describes it as "an exceptionally beautiful structure that is a decided architectural credit to the community." It certainly meets all of the criteria for a 1950s motel: turquoise paint, check. Peanut-brittle stone facade, check. Eye-catching motel sign, check. And is it AAA approved? Yes it is. A generation later, it was given a sedate, gray and white make-over and became the Surfrider. This building is currently being remodeled and is expected to open soon in its latest incarnation as the new Malibu Surfrider Motel. 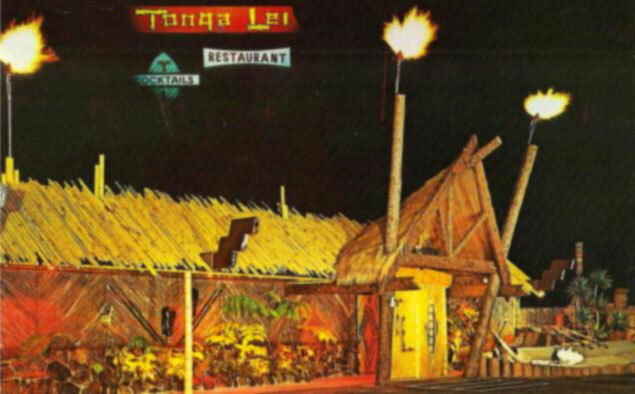 The Tonga-Lei was originally a restaurant and motel. The motel, which had nine tiki-themed rooms that matched the restaurant's over-the-top decor, kept the name when the restaurant became Don the Beachcomber. It's all gone now. The Tonga Lei, which opened in 1961 on the site of another somewhat eccentric restaurant—the Drift Inn, was famous for its Polynesian-themed restaurant and bar, which featured tropical cocktails, flaming torches and genuine carved Tiki gods, but the small motel—it only had nine rooms—attached to the restaurant was also a temple of Tiki decor, resplendent with bamboo furniture. It was replaced in 1987 with a generic three-story, 47-room hotel, touted in an L.A. Times article as "the first new hotel in Malibu in 37 years." The Malibu Sands Motel is a strip mall today. It was one of the last motels to be built in Malibu, and one of the largest. The original building was designed by noted mid-century modern architect Alfred T. Gilman in 1957. 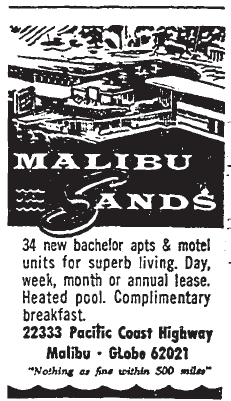 The Malibu Sands included "bachelor apartments," in addition to motel rooms. This postcard is also from the wonderful collection of Eric Weinberg at the Pepperdine University Library's Digital Archive. "Nothing as fine within 400 miles," boasts this ad from 1958. The Albatross Motel began life in the late 1940s as the Malibu Movie Colony Motel and burned down in 1963. It was never rebuilt. It has a colorful reputation that's difficult now to substantiate, and the site is reputed to be haunted—another claim that is difficult to prove. This location beautifully summarizes the trajectory of the American motel—from modern convenience to decay and from there to oblivion. 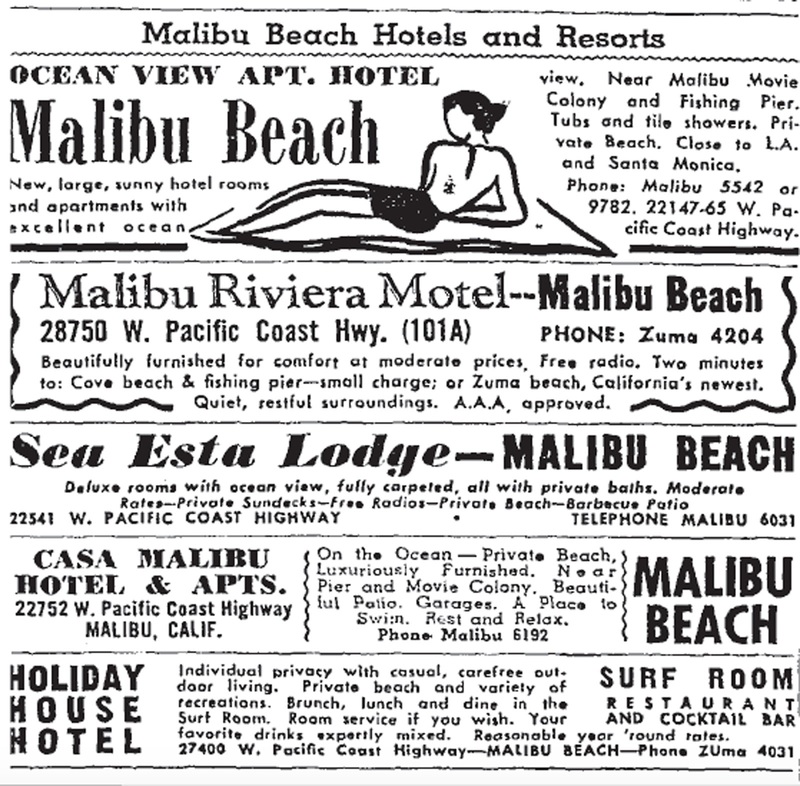 Only five of the 12 motels in and around Malibu we discussed today are still in business as hotels. This is another postcard from the Eric Weinberg Collection. There were others. The Las Tunas Isle Motor Hotel, which advertised in the Malibu Times for a couple of years in the late 1940s before turning into an apartment house. The Malibu-adjacent Santa Inez Inn on Sunset Blvd., which served delightful Sunday brunches on the patio by the pool, The Malibu Country Inn, which is said to have build in that great year for Malibu roadside motels, 1947, and has certainly been at Zuma for as long as anyone in my family can remember under one name or another, but which appears never to have produced a collectable postcard or matchbook to help refresh the memory. And the quaint shops at the original Malibu Country Mart that were once motel rooms. Next time you're there for a sandwich at John's Garden take a second look: the popular playground was the pool in the center of the motel. During the peak motel boom there was a ridiculously high ratio of hotel rooms to residents and more than enough to accommodate visitors. Many motels also offered inexpensive accommodations for summer employees and struggling writers, but there were plans to build more and more and more. Eventually the people of the community, tired of the county's vision for an L.A. version of Miami Beach, began to push back. Efforts to build an enormous motel complex across from Zuma Beach—110 rooms, a theater, a restaurant and shops—were firmly and resolutely defeated by residents in 1971. 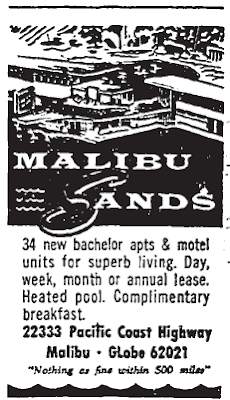 "Malibu has plenty of motels," local architect Ed Niles told the Los Angeles Times in February 1971. 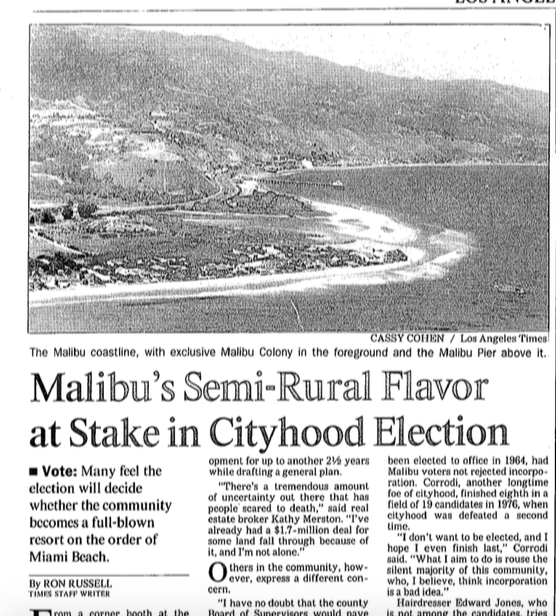 Fear that Malibu was going to be transformed into the county's vision of a resort community full of marinas and wall-to-wall hotels wasn't just hyperbole, it was one of the rallying cries of the second big push for incorporation, as this 1980 L.A. Times headline reveals. Today, with millions of visitors annually, there are concerns that there are not enough accommodations. However, what the proponents of AB 250, the assembly bill that inspired this road trip to the past, are seeking is affordable accommodations, and that era seems unlikely to return. For decades the piece of land opposite what is now Pepperdine University was zoned for a hotel. It's now supposed to become a cemetery on the argument that a graveyard is somehow visitor serving. 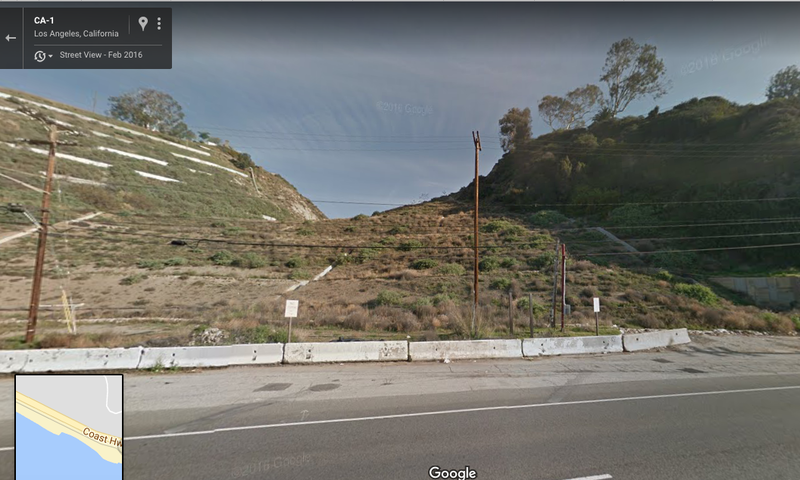 The Coastal Commission let the City of Malibu rezone the property next to Malibu Bluffs Park from a hotel to an exclusive, gated subdivision, in exchange for a $4 million in lieu fee. The problem with that is, $4 million doesn't go very far, and that property is now permanently off limits to the public the commission is supposed to be advocating for. Low-cost, visitor serving amenities like hotels are supposed to be a priority for the commission, but they haven't always been successful protecting and retaining existing resources of this type, let alone encouraging new ones. In fairness, no matter how much we may want and need affordable overnight accommodations at the beach, no matter how many hotels and hostels and campgrounds the assembly bill might facilitate within the constraints of environmentally sensitive habitat, there is probably no way to ever meet the need in Malibu without destroying what makes the community special. According to the Los Angeles County Fire Department’s Lifeguard Division, beach attendance throughout Los Angeles County has climbed from 27 million in 1967, to nearly 73 million in 2014, with an all-time high of 76 million in 2012. A huge number of those beachgoers are headed to Malibu. In 2013, we had an estimated 7.4 million summer visitors. To put that into perspective, the total number of visitors to the state of Hawaii in 2016 was 8.9 million. When one small coastal town with a population of 13,000 and less than 6000 full time residents attracts that many visitors a year it's no wonder hotels can charge $400, $1000, $2000 a night. What incentive is there to offer rooms for $100? Fortunately for those of us who like to camp and can't afford a boutique experience, there are still plenty of campgrounds. You can still camp on the beach at Thornhill Broome State Beach, or in a rustic canyon steps from the beach at Leo Carrillo State Park and Sycamore Canyon, just like the earliest visitors to the area. 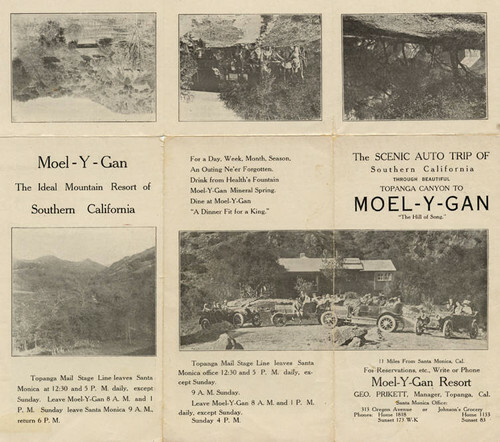 A brochure for the long-vanished Moel y Gan Resort in Topanga, the "Ideal Mountain Resort of Southern California." Image: CSUN Digital Library. The privately-owned Malibu RV Park and Campground offers sites from $70-$200 a night an easy walk from Corral Beach and Solstice and Corral Canyon Parks, while area residents, channeling the entrepreneurial instincts of an earlier generation, offer backyard "glamping," a portmanteau word even more awkward than "motel." 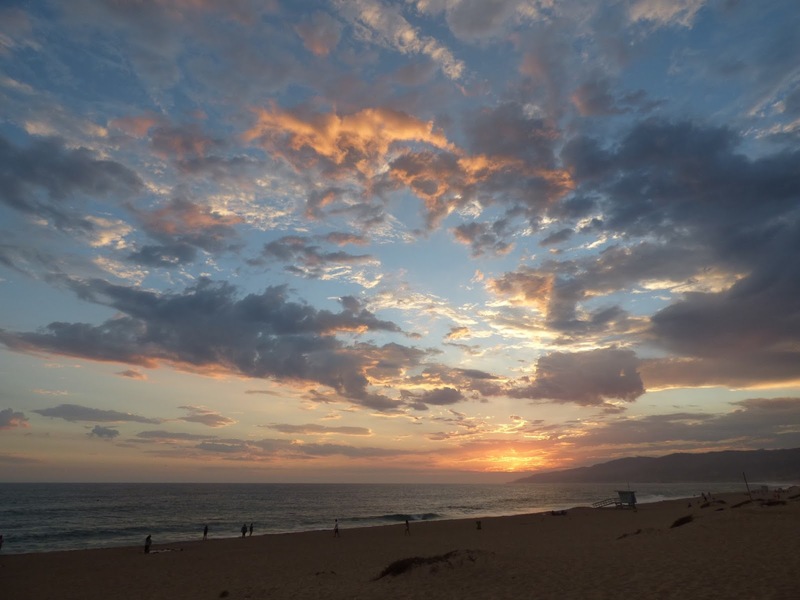 They also offer holidays in yurts, cabins, and Air Streams, at locations all over the Santa Monica Mountains and coast. Like camping facilities in and around national parks all over the country, these facilities fill up fast during peak season and are often mostly empty in the winter. None of those things, even the state park campgrounds, is as affordable as it would have been in the 1950s, neither is the car and the gas required to get one there. Time passes, and is passing, and is past, the poet says. The era of the cheap, clean, convenient motor hotel is over and probably isn't coming back. And like James Lileks noted, nostalgia for old motels, like most forms of nostalgia, is selective. Expecting that era to return in a time of $2000-a-night boutique hotels and $45 million beach houses is wonderfully optimistic, whether it is also realistic remains to be seen. You can read the text of AB 250 here, and also follow its progress through the committee and appropriations process. 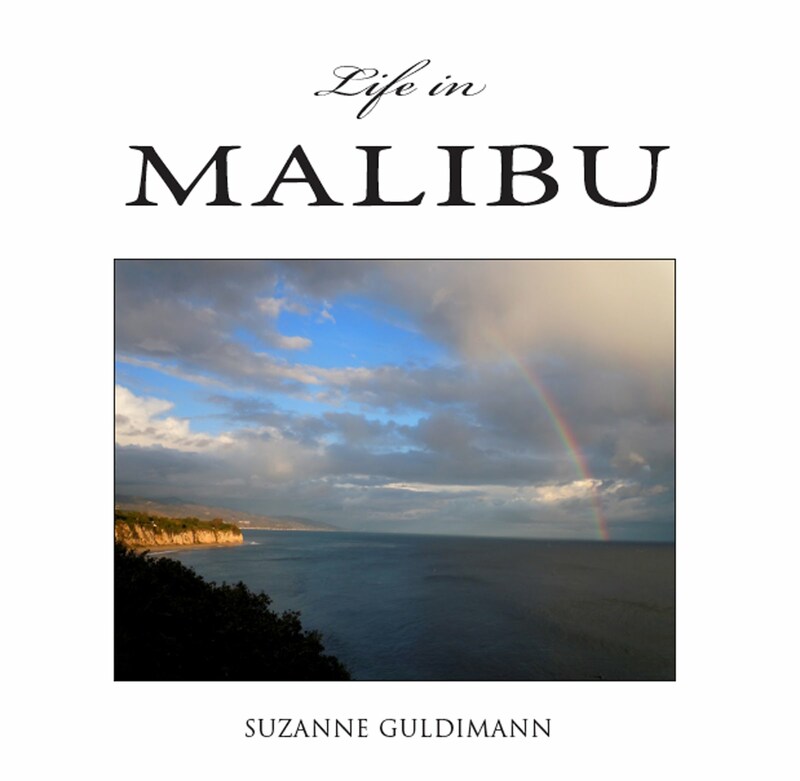 It's important to note that it apples to the entire Coastal Zone, not just to Malibu. This is what has always drawn visitors to Malibu, the roadside motels and overpriced boutique hotels are just a means to this end. This view, whether we stay for an hour, a week, or a lifetime, belongs to all of us, Let's hope it will always be protected, cherished, and open to everyone. Wish you were here. I wish you were on FB to see the outstanding response your article is getting just in the Friends of Malibu group, plenty are sharing it and also receiving great input! You've done it again, hitting our hearts and fueling our minds. Much appreciation and admiration for all that you do, especially how well you communicate facts and educate all of us. Love that place, so beautiful. Great article! Just wanted to add some info re: Las Tunas Isle Motel...it was still very much up and running as a motel into the 1960's and 70's. My family stayed there several times and absolutely loved it. It had not been turned into apartments, it was still a motel, although the rooms were large sized and many had refrigerators and stoves. We loved staying in the "Baby Bam" room, which was entirely covered in bamboo. There was a larger room that cost more money and was called "Big Bam" I think. The pool had begun to be let go without chlorination, but hey, we were kids and still loved it! It was right on the beach and even for a working class family like ours, totally affordable for a full five days. Apparently back in the day, the Hollywood crowd loved Las Tunas motel. The rooms were so kitschy and crazy! I currently have a rare vintage brochure from Las Tunas for sale on ebay that my family held onto for years. I won't put the link here, but you can search and find it there. Would love to pass it along to a collector! My ebay I.D. is Vintagerama. I also have a rare motel card from Tonga Lei for sale too. Today, the Las Tunas motel is a private residence as far as I can tell. 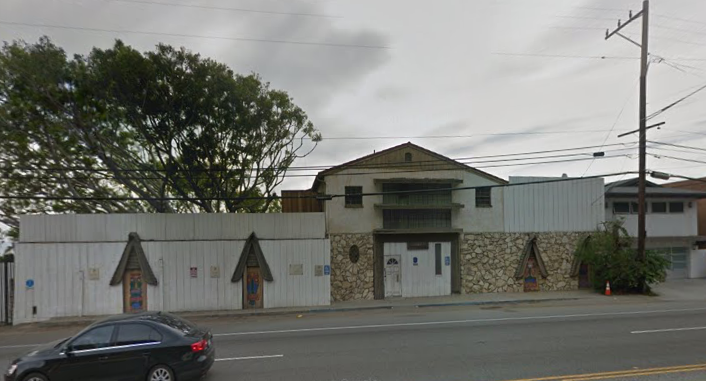 It still retains a certain beachy tiki look to it in the front, but it's hard to tell from google street view. Thanks again for your excellent and informative article. I sure do miss the wonderful (and affordable) motels that used to be on PCH.